Product prices and availability are accurate as of 2019-04-17 09:26:03 EDT and are subject to change. Any price and availability information displayed on http://www.amazon.com/ at the time of purchase will apply to the purchase of this product. 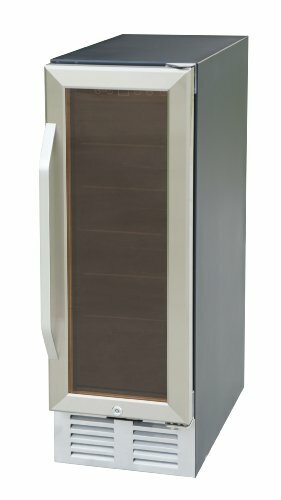 This under-counter (built-in) wine cooler stores up to 19 standard 750ml wine bottles. Elegant stainless steel trimmed and dual paned glass door adds sophistication to any kitchen or bar setting. Digital panel with adjustable temperature between 41°F to 72°F. Front ventilation allows flush built-in application. Unit Dimension (no handle): 11.61W x 22.64D x 34.25H in. 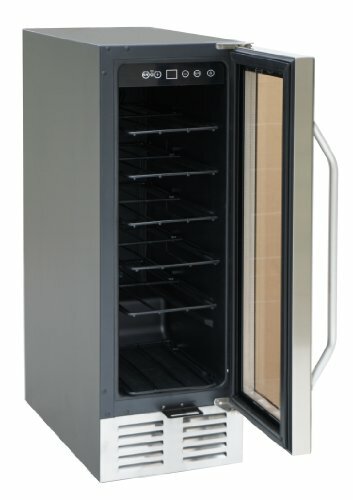 Unit Dimension (w/handle): 11.61W x 24.5D x 34.25H in. Internal Dimension: 8.5W x 16.5D x 24H in. Compressor Step: 6.5D x 3.75H in. Shipping Dimension: 26 x 15 x 38 in.